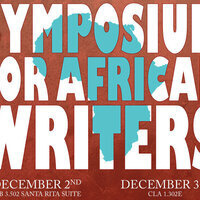 The Ethnic & Third World Literatures specialization at the University of Texas at Austin invites you to a landmark symposium featuring five of the most powerful, popular, and innovative writers in contemporary African literature: Taiye Selasi, Maaza Mengiste, Sofia Samatar, Nnedi Okorafor, and Laila Lalami. Selasi's Ghana Must Go (2013) challenges us to think about family and love across nation-states and continental imaginaries; Samatar's A Stranger in Olondria (2013) uses epic fantasy to engage themes of imperialism and exile; Mengiste's Beneath the Lion's Gaze (2010) brings to life the intimate tragedies of the "Red Terror" in 1970's Ethiopia; Lalami's The Moor's Account (2014) tells the story of the New World's first explorer of African descent, Estebanico; and Okorafor ranges prolifically across science fiction, fantasy, young adult fiction, and Afro-futurism. To describe these writers as either "American" or "African" would be to miss what is most vital about authors whose literary horizons are not bound by birthplace, passport, or skin color. We are excited to welcome them to UT Austin for a two-day symposium featuring readings and discussions of their work, and we hope you will join us.